James Comey weighs in on the controversy surrounding Supreme Court nominee Brett Kavanaugh and the decision last Friday to order an FBI investigation. The New York Times published a strongly worded op-ed written by former FBI Director James Comey on Sunday. We live in a world where the president routinely attacks the F.B.I. because he fears its work. He calls for his enemies to be prosecuted and his friends freed. We also live in a world where a sitting federal judge channels the president by shouting attacks at the Senate committee considering his nomination and demanding to know if a respected senator has ever passed out from drinking. We live in a world where the president is an accused serial abuser of women, who was caught on tape bragging about his ability to assault women and now likens the accusations against his nominee to the many “false” accusations against him. Most disturbingly, we live in a world where millions of Republicans and their representatives think nearly everything in the previous paragraph is O.K. If truth were the only goal, there would be no clock, and the investigation wouldn’t have been sought after the Senate Judiciary Committee already endorsed the nominee. Instead, it seems that the Republican goal is to be able to say there was an investigation and it didn’t change their view, while the Democrats hope for incriminating evidence to derail the nominee. 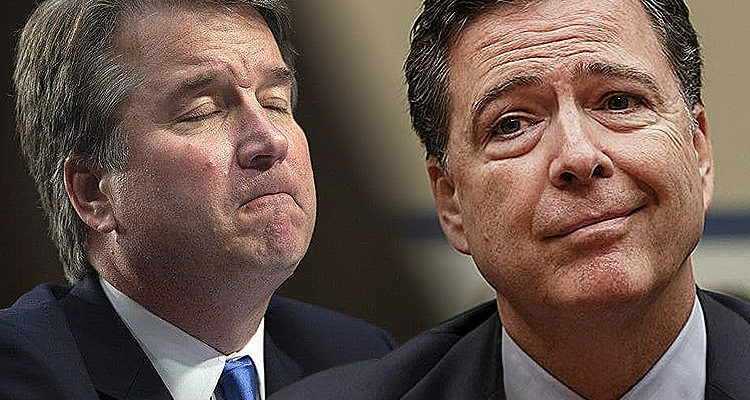 Speaking to the reliability of Dr. Christine Blasey Ford as a witness, Comey contradicted the standard response by Republicans and Kavanaugh defenders that since the alleged assault happened 36 years ago, her memory is somehow flawed. Yes, the alleged incident occurred 36 years ago. But F.B.I. agents know time has very little to do with memory. They know every married person remembers the weather on their wedding day, no matter how long ago. Significance drives memory. They also know that little lies point to bigger lies. They know that obvious lies by the nominee about the meaning of words in a yearbook are a flashing signal to dig deeper. There is one passage in his article that does raise concerns for Democrats and those opposed to Kavanaugh’s confirmation. [M]ultiple media reports this weekend have suggested that the FBI’s inquiry is far more constrained than previously known. Initially, Republicans set just two parameters: that the investigation had to be complete in under a week, and that it had to be limited to “current credible” allegations against Kavanaugh. But on Saturday, NBC News and The Times reported that the White House and Senate Republicans gave the FBI a list of just four witnesses to interview. Investigators are also reportedly barred from pulling records that could be critical to corroborating parts of the testimony given by Dr. Christine Blasey Ford, who says Kavanaugh sexually assaulted her in 1982, to the Senate Judiciary Committee earlier this week. It’s unclear how deep the FBI will be able to dig, however, given the additional limits that have been placed on the scope of the investigation.